Yay! It’s Thursday evening and the weekend starts here! I’m super-excited as I’ll be spending tomorrow around the fabulous pubs of London town before jetting off to Copenhagen to party with Mikkeller & Co. at the CBC. I have a feeling that my poor old liver might be in for a bit of a workout so tonight I’m being super-healthy! 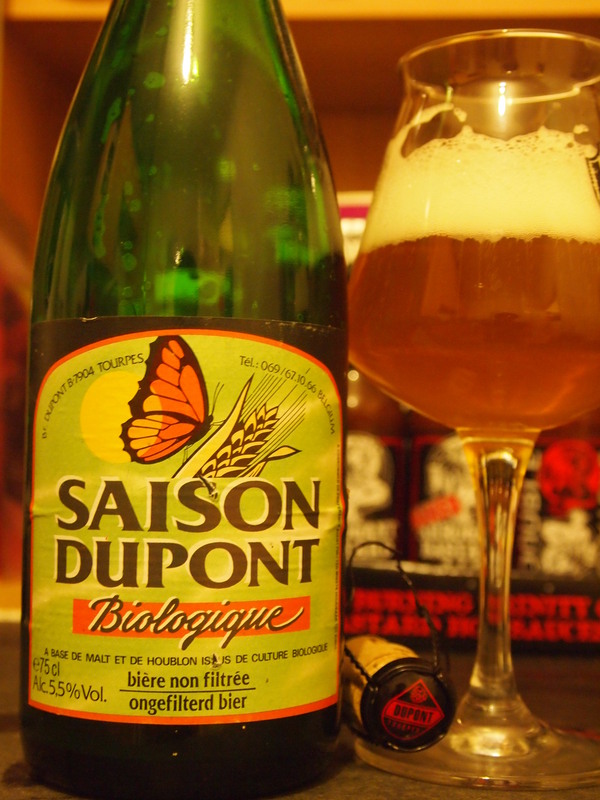 As well as being a beer-geek, I’m also a bit of a juice-monster so tonight I juiced a generous shot of fresh wheatgrass and what better to wash down that wholesome green juice than a delicious organic Saison Dupont Biologique (5.5%ABV) from Brasserie Dupont! Isn’t the label so lovely – you could almost see it on the shelves of a health-food store among the tonics and coconut water. In fact, Saisons were originally brewed by farmers because it was better for their workers to drink than the dirty water which might have made them sick. Saison is a style I’ve been slightly suspicious of but I’ve been making an effort to try a little more. I just think it smells a bit like a farm yard sometimes. I’m learning to love them for their unusual character and it’s a pretty good thirst-quencher for this warmer weather. This one actually had more of a lager-like aroma when I popped the cork; it took me back to those mornings I spent as a student tipping away dregs from Carling tins as I cleared up from the party the night before. In the glass there’s an additional note of honey rising from the lively carbonation. It’s a pretty beautiful shade of yellow-orange with a generous puffy white head.The flavor is super-crisp with banana and cinnamon and a lot of yeast. There’s a touch of sweet citrus but a lot of bitterness. The wheat and hay combined with the sunshine color and the arid dry finish make me long for a real summer I can spend outdoors.